When documentary photographer Daniel Levin visited violinmaker Amnon Weinstein in May, his goal was to bring Weinstein’s workshop home to Cleveland through photographs that show the 68-year-old Tel Aviv man restoring Violins of Hope. 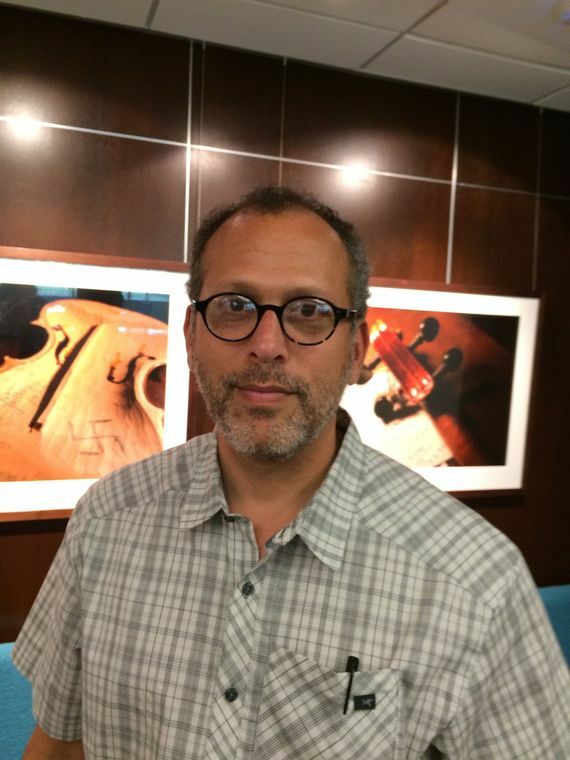 Levin, an associate professor of photography at Cuyahoga Community College, visited Weinstein and his wife, Assi, for 3 1/2 days, documenting Weinstein as he unpacked violins, treating them to a loving, detailed process designed to bring back the quality they had during the Holocaust. Levin’s project is but one part of Violins of Hope, a multifaceted, multi-institutional project designed to unfold through next spring and beyond. Among the imminent, initial highlights of this homage to instruments that survived the Holocaust even when the people played them didn’t: an invitation-only concert Sept. 27, featuring Israeli violin virtuoso Shlomo Mintz on a Violin of Hope, inaugurating the Milton and Tamar Maltz Performing Arts Center on the Case Western Reserve University campus in Cleveland, and the Oct. 2 opening of “Violins of Hope,” a multimedia exhibit featuring some 50 such violins, at the Maltz Museum of Jewish Heritage in Beachwood. The 74 photographs Levin culled from some 1,700 images he captured track Weinstein in Tel Aviv as he meets his wife for lunch, scours Tel Aviv’s Dizengoff flea market for memorabilia related to stringed instruments associated with the Holocaust, and handles the mainly workaday fiddles he’s dedicated to reviving. Curated by Levin and Israel Wiener, the Jewish Federation of Cleveland’s arts and culture consultant, “Amnon’s Workshop” is a highly tactile exhibit. These are close-ups of process, of affection, of humanity. They bring you not only into Weinstein’s neighborhood, but also into his head. The photographs, the majority of them 22 inches by 17 inches, seem to pop out from the walls of Roe Green. Mostly hung, high-tech, in grids secured to galvanized metal frames by rare earth magnets, they impress in mass and warmth. You can almost hear the instruments. “I was interested in the man and his identity,” Levin said in a Sept. 18 interview at the gallery. “I assumed his identity would come through the objects in his workshop, in his place.” Actually, two workshops: A basement one where Weinstein does most of his work and a second-floor workshop in an adjacent building that is more of an office and waiting room. What also impressed Levin about Weinstein was his historicity. Not only is Weinstein dedicated to ensuring that the lessons of these Holocaust violins are never forgotten, he’s the son of Moishe Weinstein, a violinmaker, and the father of Avshalom Weinstein, also a violinmaker. Weinstein, who apparently can tell the kind of music that was played on the instrument, is a kind of violin “whisperer,” Levin suggested. The master violinmaker seems to tune into a violin’s spirit. “Thank you my friends for letting me invade your lives, if only for a brief time,” Levin says in the brochure. Levin’s “home invasion” of Weinstein in Tel Aviv has resulted in a loving, resonant exhibit.